The best time to visit the Kruger National Park is, surprisingly, during the winter season. The reason for this is that the grass and leaves are minimal, leaving you with a better chance to spot the exotic wildlife on offer. Also, many births occur in the winter months, meaning that a safari during that period offers a unique viewing spectacle. Autumn is the worst time of year to visit if you are interested in catching a glimpse of the “big five” as the grass is dense and high then. The Kruger National Park is one of the most famous safari destinations in South Africa and indeed Africa. It is home to an enormous variety of plants, birds, and mammals (including the “big five”) There are 147 mammalian species found in the park ranging from the majestic Leopards and Lions to the mischievous Spotted Hyenas. Birdwatchers will have 517 different species to view, depending on the time of the year. In particular, the park is home to many raptors or “birds of prey,” as they are otherwise known, including the Bateleur and the Martial Eagle, the Tawny eagle, the African fish-eagle and the African hawk-eagle. Besides the animals that live in the Kruger National Park, there are also 1,982 plant species. The park’s gates are open year round, usually from 5:30 am to 6:00 pm. The Kruger National Park has all the facilities that one would expect from a world-class holiday destination. The accommodation in the game reserve is spread across different campsites. There is a bank and ATM inside each park and a few ATM’s at some of the camp shops, though these don’t always have cash. Every main rest camp has a fuel station. There are Internet café’s at most of the main camps as well as cell phone reception. So, you can rest assured that you will still be “connected”. There is also a medical doctor in the park in case of emergencies, as well as hospitals nearby. The Kruger National Park is a beautiful getaway and welcomes visitors from all over the world. However, it is important to follow the rules that are. printed on the entrance permit. The South African Police Service (SAPS) have recently cracked down on those who don’t follow the rules. In fact, the Kruger National Park official authorities have increases fines by 250% for this festive season (2009). In addition, stop and search operations will be held on all the major roads in the park. The reason is to help ensure a safer experience for everyone. There are many options available for tours and accommodation at the Kruger National Park that cater for (almost) any budget. If you are after quality accommodation, it is advisable to book way in advance, because prime locations are snapped up very quickly. 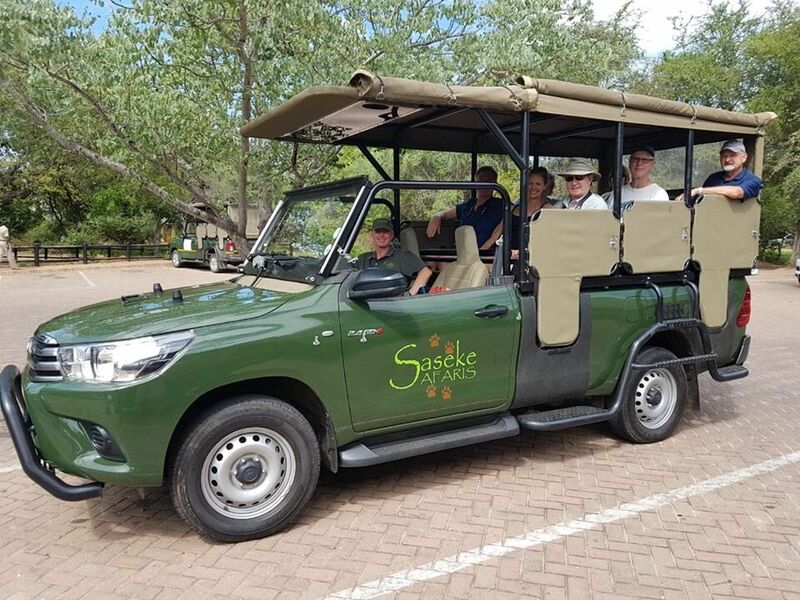 “Join Saseke Safaris in the game-rich Crocodile Bridge Section of Kruger National Park on an Open Vehicle Safari”.